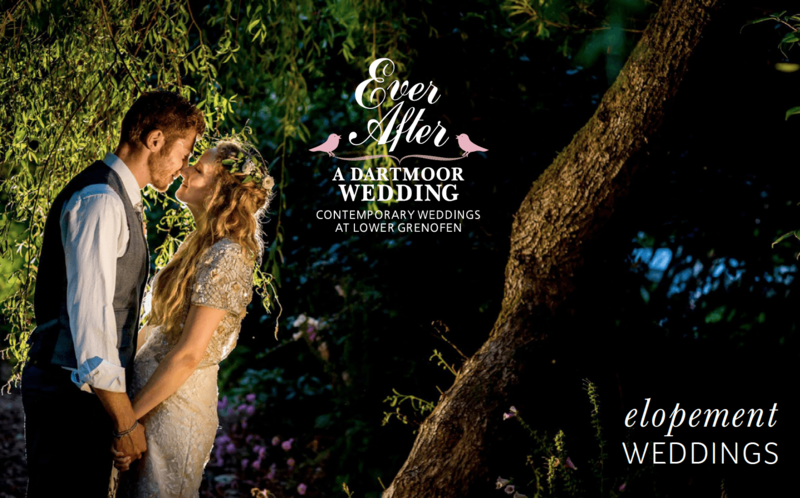 I’ve received a number of enquiries for smaller weddings and I couldn’t see a way to offer them here at Ever After – A Dartmoor Wedding. I was hearing from couples that they wanted to get married at Lower Grenofen but they wanted a tiny, intimate wedding with either no guests or just a very few. They wanted to have the venue to themselves and I was looking for a way to fit that round our wedding marquee which you don’t want or need if you’re having a micro wedding but is too wieldy for us to take down between weddings. Other venues offer elopement weddings but it’s hard (no, make that impossible) to give exclusive use of a large wedding venue for tiny weddings – it just doesn’t make sense for the venue. But it makes sense for us and I finally figured it out! So here we are launching elopement weddings at Ever After. Next week it all goes live on the website but I wanted to give you a sneak preview here on the blog. I was looking for an offer which made it super easy for couples to “Elope and Have it All!” (thanks to Amanda Randell for that – it perfectly sums up what we’re offering!). 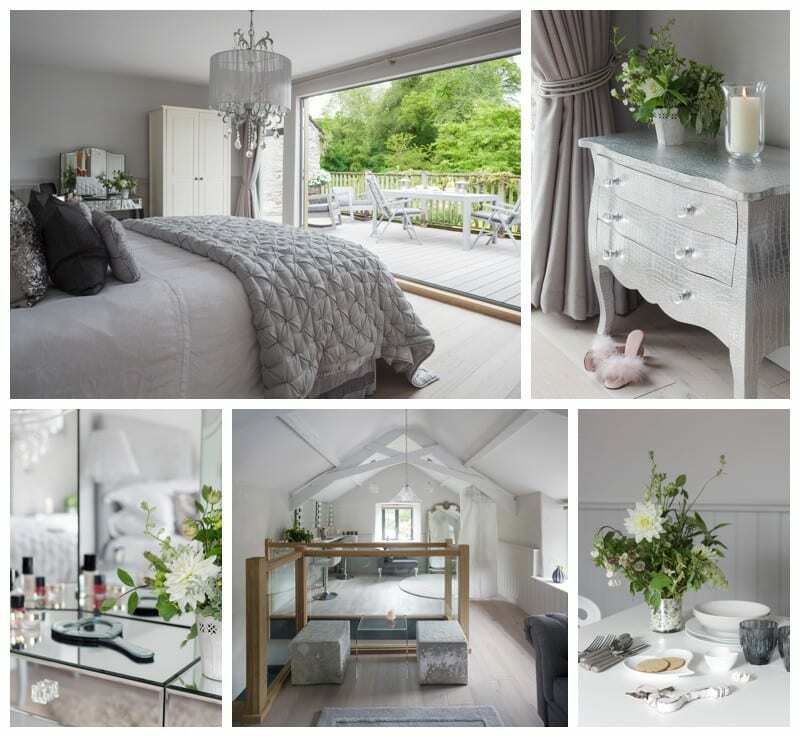 I got together with some of our fabulous Tavistock wedding suppliers and now have the perfect elopement package for couples looking for laid-back luxury. So what do you get? You get everything you need for a fabulous wedding including photography, flowers, fizz, food and accommodation. I know, perfect – right? You have a choice for your wedding ceremony location. 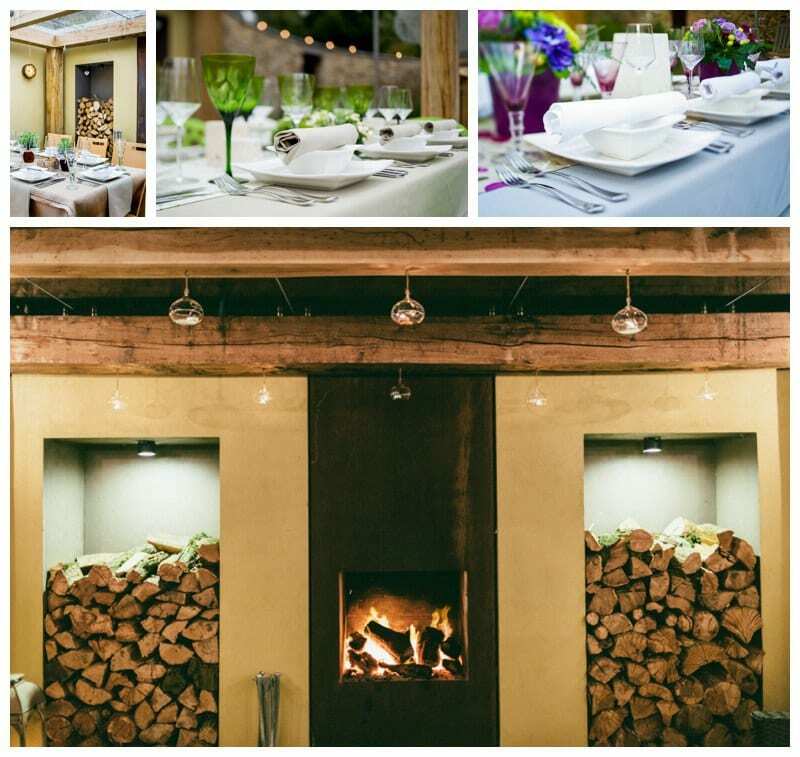 You can either use our oak wedding barn or for something really different, in front of the open fire under our glass roof which has been licensed by Devon County Council just for elopement weddings. With our clear rain screens, the space is light and airy no matter what the weather outside and we’ll decorate with lanterns and candles to make an oh so cosy space. Hiring a photographer for a whole day might seem hard to find or even out of budget for an elopement wedding. Sorted! We’ve got fabulous local photographer Clare Kinchin who will come and photograph your wedding for an hour which is plenty of time to get all the shots you need of your ceremony, champagne celebration and couple shots. Where can you find a Chelsea Gold Medal winning florist who would create a wedding bouquet just for you? Right, here at Ever After, as we have Amanda Randell, Master Florist just down the road from the venue who will deliver one of her amazing wedding bouquets in the colours of your choice. Pop the corks and celebrate in style as we provide champagne (with crystal glasses natch) and hand-made canapes. It doesn’t end there as you will then tuck into fabulous seasonal food prepared by your very own cordon bleu trained private chef who will prepare a delicious 3 course lunch or dinner on site and then serve at your table. Relax in front of the fire, find a seat on our river walk or take a stroll in our 46 acres of woods. Finally, spend your wedding night in our luxurious 18th century stone honeymoon cottage with wood burner, cosy living room and sumptuous bathroom. What if you want to bring along just a couple of guests? We’ve added an option for you to bring up to 8 guests (making 10 of you in total) for an additional cost per head to include champagne, canapes, wedding breakfast lunch or dinner and of course – cake! Next week you’ll be able to download our elopement brochure and our special seasonal elopement menus direct from the website but if you can’t wait that long, email me through the contacts page of the website and get an advance copy straight to your inbox.